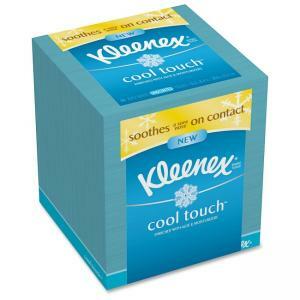 Facial tissue soothes on contact by actively releasing a cool sensation to relieve your sore nose with a unique cooling comfort. Enriched with cooling moisturizers, the three-ply tissue actually draws heat away from the skin and creates cooling on contact. Kleenex Cool Touch facial tissue is made with a proprietary blend of ingredients, including cooling moisturizers and aloe.